TESOL International Association, a world leader in advancing expertise in English language teaching and learning, is excited to announce that it has signed an innovative agreement to form a knowledge partnership with 21st Century English Education Media, a leading ELT organization and publisher of English language learning and teaching resources in China. 21st Century English Education Media is a subsidiary of China Daily, China’s only national English-language newspaper which is distributed globally. The agreement, signed 22 July in Changzhou, China, strengthens the mission and growth of both organizations. TESOL and China Daily 21st Century have agreed to collaborate on a number of new initiatives, including a three-day TESOL professional learning event in China in 2018. Additionally, the organizations will collaborate on teacher workshops and other regional and national English language teaching events throughout China. As part of the agreement, China Daily 21st Century will help identify 2,000 new global members from across China, granting valuable access to TESOL’s professional development resources and international networks. In addition, both organizations have agreed to explore other areas of English language teaching and learning. "TESOL and China Daily 21st Century share similar interests in advancing English language teaching in China," according to Executive Director Christopher Powers. "We look forward to a very productive and wide-ranging relationship with China Daily 21st Century for years to come." 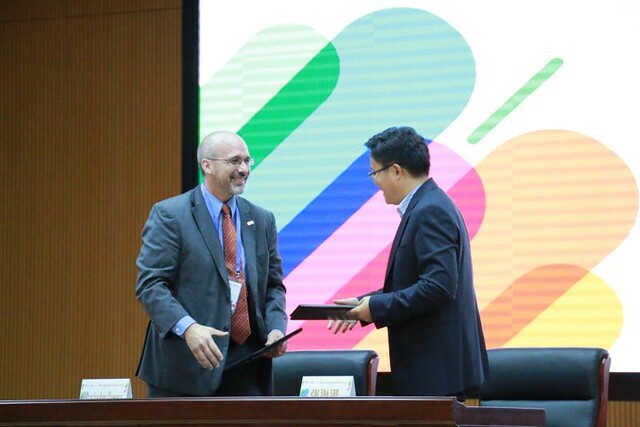 This agreement will afford TESOL the opportunity to share its expertise in developing research-based English language teaching practices, industry-leading live events, expansive professional development resources, and rich publications with English language professionals throughout China. View a photo gallery from the event below.